Hall of the Mountain King: Review: Nevermore, "The Obsidian Conspiracy"
Instead, The Obsidian Conspiracy draws from many of the elements of Dane’s and Loomis’ solo records in the intervening years. Most notably, Dane’s vocals seem to take a larger role here than they have on past records, and he also uses more of the range that we saw on Praises to the War Machine. That said, this record is not that much of a departure for the band. The tight, fast guitar riffing is still there in abundance. Dane’s warbles still range from majestic to sinister, and the entire band is locked in perfect sync throughout. The effect of Dane’s solo work really begins to be felt on third track, “Moonrise.” The song features one of the faster verses on the record, but then slows down for a powerful chorus and finds Dane even doing a little spoken word bit. 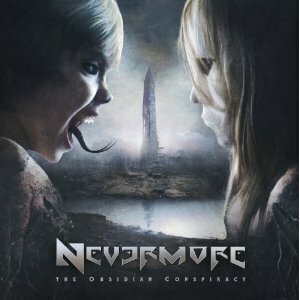 The vocals really carry the song, which hasn’t always been the case for Nevermore. That’s followed up by “And the Maiden Spoke,” which is one of the stranger songs on the record for me. Musically, it bashes away satisfyingly for fans of the band, but vocally and lyrically it’s a bit weird, delivered on the verses more as a storyteller spinning a tale rather than song lyrics. Ultimately, the song has grown on me, and I really like it. Another interesting vocal delivery comes on “The Day You Built the Wall,” a slower, darker number that finds Dane dishing out a deep spoken, at times almost growled, cadence that’s often doubled by a higher pitched singing part. “The Poison Throne” features some gang shouts of “Rise, Rise” throughout that sound a little strange for the band. A few misses litter the record. I like the trippy guitar effects and Loomis’ soulful solo on “The Blue Marble and the New Soul,” but the song as a whole doesn’t do much for me. Likewise “Without Morals” is not a bad tune, but not very exciting either. Those songs are the exception rather than the rule, however. There are some classic Nevermore pieces here, too. Chief among them is the title track, an all-out burner with Loomis shredding away in very much what you’d expect from the band. Album opener “The Termination Proclamation” delivers a huge, memorable chorus, as does “Emptiness Unobstructed.” “She Comes in Colors” is one of my favorite pieces here, opening as a ballad with some tasty lead and acoustic work from Loomis that morphs into a heavier and darker tune about halfway through. In the end, I find The Obsidian Conspiracy, for some reason, a little odd. It’s a bit hard to explain, but the structure of the record has more of the feel of a story than an album, and perhaps that’s intentional. At the same time, it’s still definitely a Nevermore record and still likely destined for my year-end best list. It won’t top This Godless Endeavor, but fans of the band should not be disappointed.